We are now the proud owners. or. Stewards... of the internet! Our DSL line was finally activated today! ...Unfortunately the only place for our modem where it can be plugged into all the things it needs to be plugged into is directly in the middle of our hall, in front of the bathroom. So, we're going to have to do something about that. Now I can do research and post photos and write endlessly about my entry into a Socialist nightmare at my leisure! Oh yeah, the other cause for celebration: I'm a famous blogger. And now, for your viewing pleasure, a picture of my window in the studio at school. 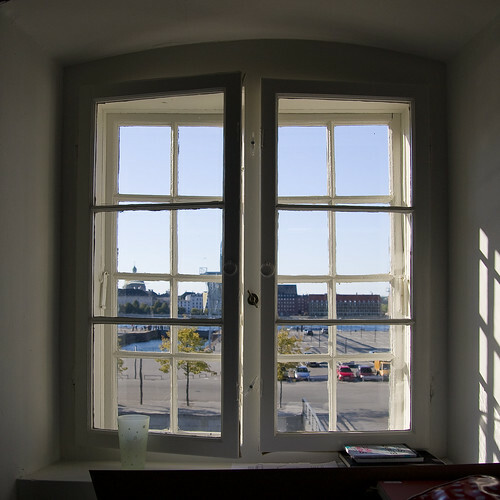 Looks out into the harbor and across to the Queen's Residence at Amelienborg Palace. Today there was a rather ostentatious yacht parked in front, which is apparently owned by a Russian billionaire, owner of the Chealsea Football Team in the UK. One wonders what exactly a Russian billionaire is doing in Copenhagen at this time of year, when you could be somewhere warm. My collection of books on the windowsill include 'Hertzberger's Amsterdam' (a gift from my boss at Tekton); the irreplaceable 'Elements of Style', and a small book on modelmaking. Add to that Jane Jacobs' 'The Life and Death of Great American Cities', and you have my complete repetoire at this moment. I wasn't able to bring many books with me, but I've found some excellent English book stores that specialize in architecture books, so I'm sure this collection will grow.